Army Sgt. Bowe Bergdahl and his attorneys have arrived at a courthouse where they’ll try to convince a military judge that President Donald Trump violated Bergdahl’s due process rights. Bergdahl wore blue dress pants and a white shirt Monday when he and his lawyers entered the courthouse at Fort Bragg for the 9 a.m. pretrial hearing. The hearing is expected to focus on statements that Trump made during the presidential campaign. Trump called Bergdahl a “traitor” repeatedly and said he deserved a harsh punishment. Bergdahl is scheduled for trial in April. He is accused of endangering the lives of soldiers who searched for him after he walked off his post in Afghanistan in 2009. Military prosecutors say reasonable observers would understand that Trump’s campaign comments should not be taken literally. Lawyers for Army Sgt. 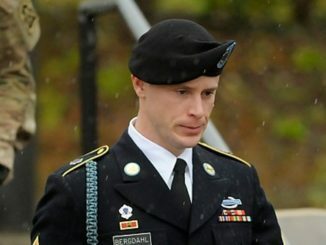 Bowe Bergdahl will try to convince a judge that he cannot get a fair trial on charges of desertion and misbehavior before the enemy because of highly charged statements made by President Donald Trump. A pretrial hearing Monday before a military judge at Fort Bragg is expected to focus on statements that Trump made during the presidential campaign. Trump called Bergdahl a “traitor” repeatedly and said he deserved a harsh punishment. Military prosecutors say reasonable observers would understand that Trump’s comments amounted to campaign rhetoric and should not be taken literally.